SECO/WARWICK is pleased to announce that SECO/WARWICK Allied Pvt. Ltd. is relocating to a new operating facility in Mahape, Navi Mumbai, India. To better serve its customer base in India, SECO/WARWICK relocated its operations to a new production, assembly and test equipment facility. With dynamic business development, SECO/WARWICK to improve its production capability, capacity and efficiency decided to relocate to a more suitable industrial park, with respect to logistics and supply chain in close proximity of local vendors and subcontractors. The new facility houses sales and marketing departments, design, workshop, service along with the senior management to serve SECO/WARWICK’s clients in India. It provides a great opportunity to improve the company’s production efficiency with engineering, production and quality control team in a single location. With the current orders in hand and many upcoming ones, consolidating manufacturing and corporate office in one location will streamline production processes and create boundless opportunities to deliver an exceptional standard of service to customers. “SECO/WARWICK’s goal is to deliver high quality solutions to our customers by having the process of design to dispatch under one roof. In doing so, we optimize our processes in project management, vendor development and quality control. We see a significant growth of opportunities in the long term and continuously develop our operational capabilities to ensure our competitive advantage,” states Sławomir Woźniak, Managing Director, SECO/WARWICK India. 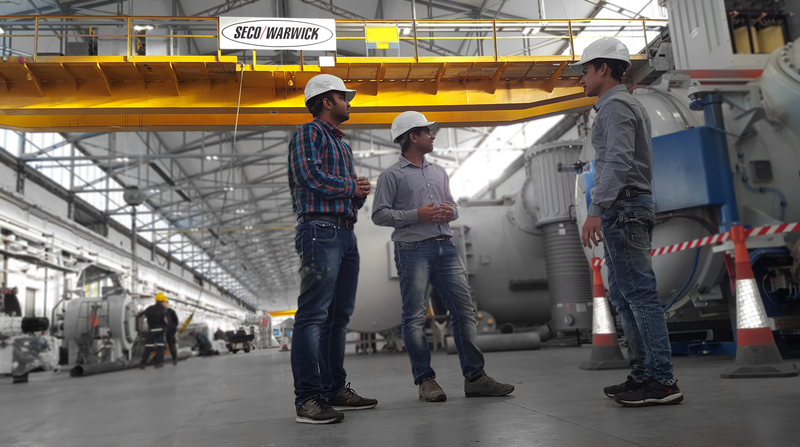 SECO/WARWICK has been present in India for many years and has successfully designed and manufactured a wide range of heat treatment equipment installations. In 2008, Joint venture was formed with Allied Consulting Engineers Pvt. Ltd. (India) and company was then named as SECO/WARWICK Allied Pvt. Ltd. In 2013, SECO/WARWICK S.A acquired a majority stake in the company. As an integral member of the SECO/WARWICK Group, SECO/WARWICK Allied Pvt. Ltd. shares engineering expertise and provides local manufacturing services for SECO/WARWICK Group equipment in India. With facilities in the USA, Europe, India and China SECO/WARWICK creates E2E heat treatment solutions that provide the best value to customers in terms of timing, availability, pricing and quality. Company is 100% committed to provide all of its customers in India with the most efficient, technologically innovative and reliable equipment available globally. Along with the relocation of the manufacturing facility, SECO/WARWICK will continue its legacy of making innovative and revolutionary products. The company contact information is listed below.